Where can I check my Burton store gift card balance? You can check your Burton giftcard balance online by clicking here. You will need the 16 digit card number printed on the back of the card and it’s PIN number. If you have a Burton e-gift card, both the card number and PIN are printed on the e-gift PDF you will have received. You can hand over the card at any Burton store and an assistant will check and tell you your balance. Click here for your nearest Burton store. Burton was founded by Montague Burton in 1903. As supplier of suits to demobilised servicemen after the war, the phrase “The Full Monty” is thought to be a reference to the store. Burton continues to offer a military discount of 10%. Post-war stores were architecturally significant, beautiful buildings in central high street locations. It was typical for Burton stores to have a snooker club above the store – some clubs survive to this day. Many of the stores still have foundation stones laid by Montague’s children. 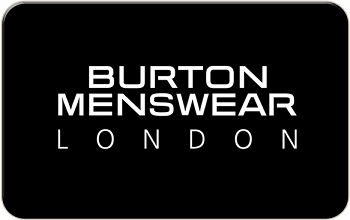 Burton is now part of the Arcadia group – Burton has over 400 stores and a huge online presence. Burton supplies fashionable suits, footwear, work and casual wear aimed at the younger market. If you haven’t signed up for their newsletter do – you’ll get 15% off your next order! Where can you buy Burton gift cards from? You can buy a Burton gift card from any Burton store. Click here to find your nearest Burton store. Burton also have an e-gift available. This is a gift card that is delivered by email for you to print out and take to the store, or spend online at their website. The advantages of an eGift are that you don’t have to wait for the postman to deliver it (it’s instant) and there are no charges for delivery. Click here to see the Burton eGift website. Where can I spend my Burton gift card? You can spend your Burton gift card in any Burton store. You can also use it online at their website – www.burton.co.uk. As Burton is part of the Arcadia group, you can use the card in other Arcadia stores, such as Topman, Topshop, Dorothy Perkins and Outfit. Anything else I need to know about Burton gift cards? If you don’t use the card for 24 consecutive months, the card will expire and you will lose any balance that’s remaining on it. Transactions don’t include balance enquiries, however you can ‘top up’ the card in-store to extend the validity if you need to; so if the card is nearing expiry it’d be a good idea to pop into a store and top up with £5 to get another 24 months to use it. You can do this in any Arcadia group store (Arcadia, Topshop, Topman, Dorothy Perkins, Outfit, Miss Selfridge) if that’s more convenient.